chandl34 wrote: Half-dragon, chemist, and rat took two tries. The rest took one try. 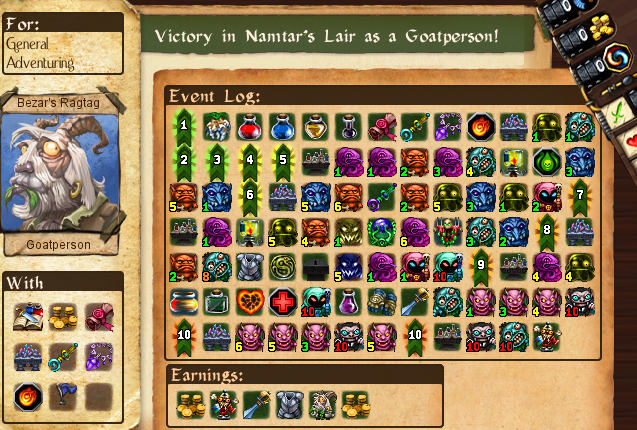 For me Monk, Goatperson and Chemist took 2 tries (goat actually more, 3 or 4), the rest went down on first go. But Chemist I basically messed up on first try, I've too much of a hoard & spike habit, and Chemist just doesn't reward that given all the potion nerfing. Chemist was really good at effortlessly killing the top-level bosses. APHEELSIK + BURNDAYRAZ + mana form made for some easy kills. 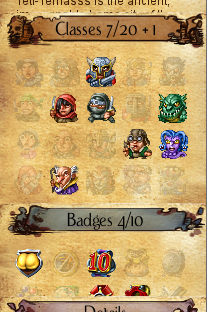 For the avatar, I think I had two levels lined up (with JJ), a death protection, and JadeTooth's potion. 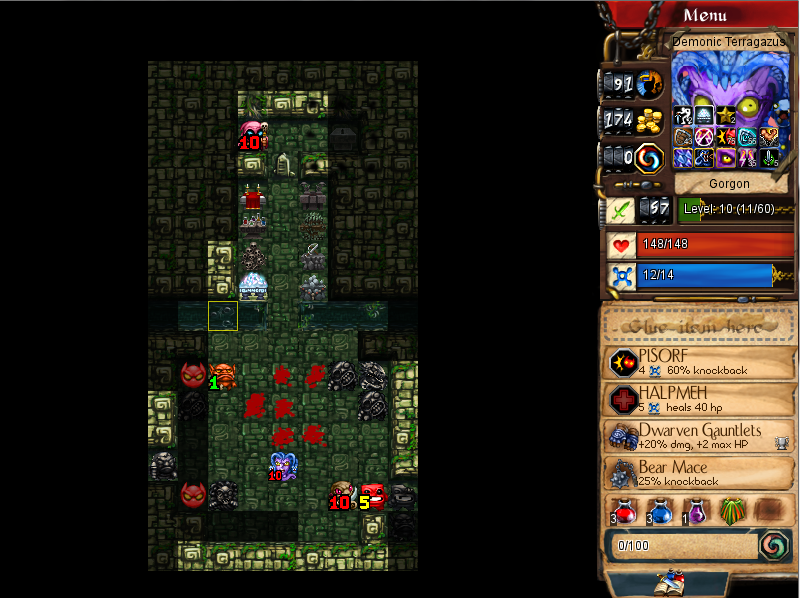 I brought Tower Shield out of my veto slots, and that really helped on this dungeon. I've owned the goat DLC since I bought the game last year, but I haven't gotten around to buying the glade yet. 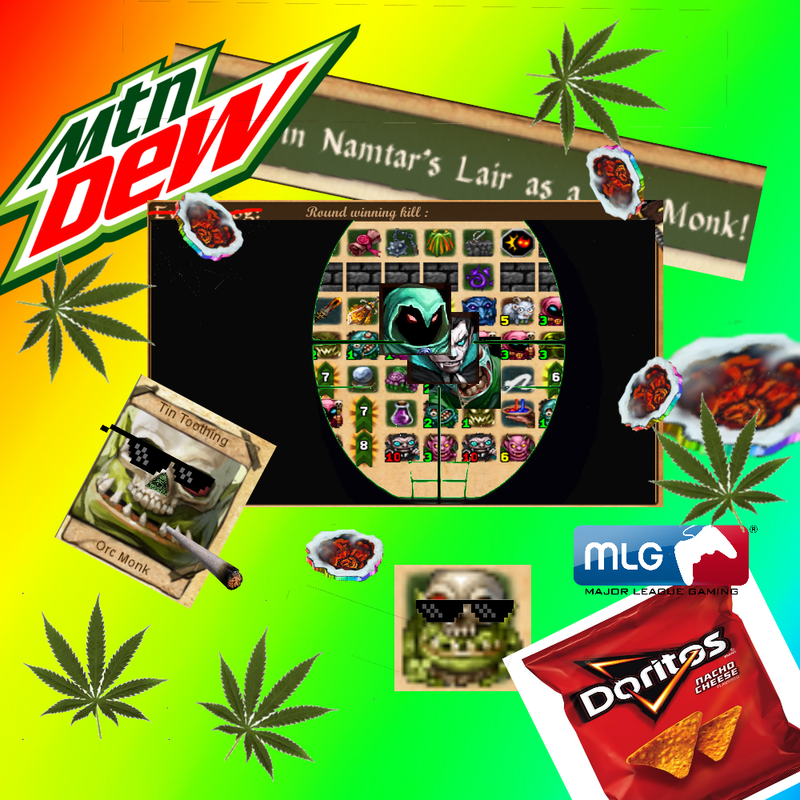 I want to try to rainbow everything first, then I'm going to replay all the dungeons on goat mode. Oh man, this was nasty. It started off great. I found EM and Pactmaker early, so I was able to get an early start on my resists/hp/dr. I also found the potions subdungeon, as well as a box of health potions in a shop, giving me a total of 12 health potions. Unfortunately, I couldn't find platemail or tower shield like I was hoping, so my resists built up slower than I would've liked. To beat the first demon, I had to buy the vampiric blade, which means I had to drop my EM piety farm and switch to Mystera. 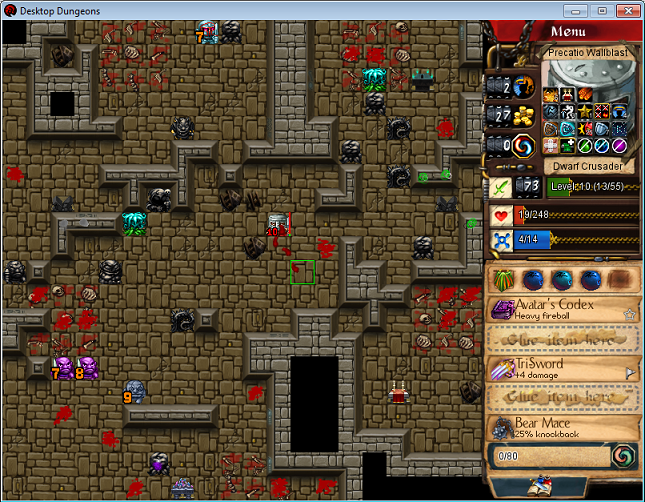 The rest of the demons went down easily, but I spent all my mana potions and 2 schadenfreudes in the process. 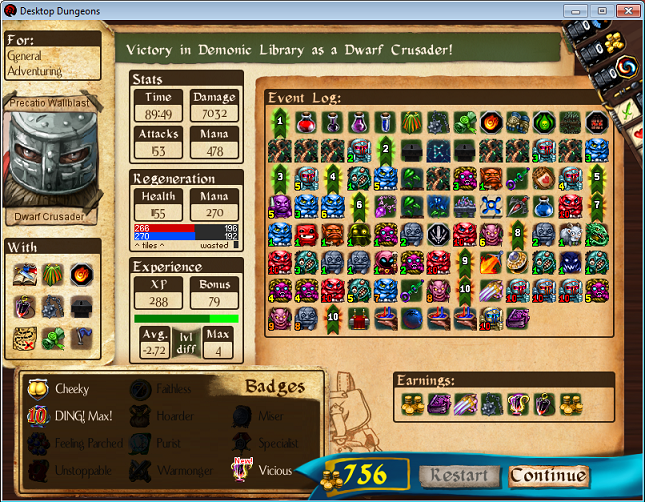 I used the battlemage ring temporarily to handle the final demon (physical resist/weakening). I had 11 health potions going downstairs, and I brought in piercing wand initially to work down the Avatar. As always, a strong ??? spawned on the staircase, so I had to spend some resources to get it out of the way, and knocking another ??? behind the Avatar. 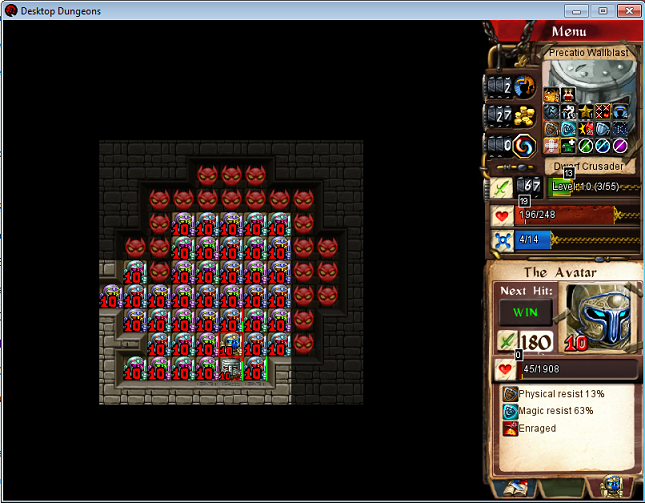 I was spending a health potion every two hits on the avatar, until I hit his berserk and it went to one per hit. I finally ran out of juice exactly two hits short of victory. 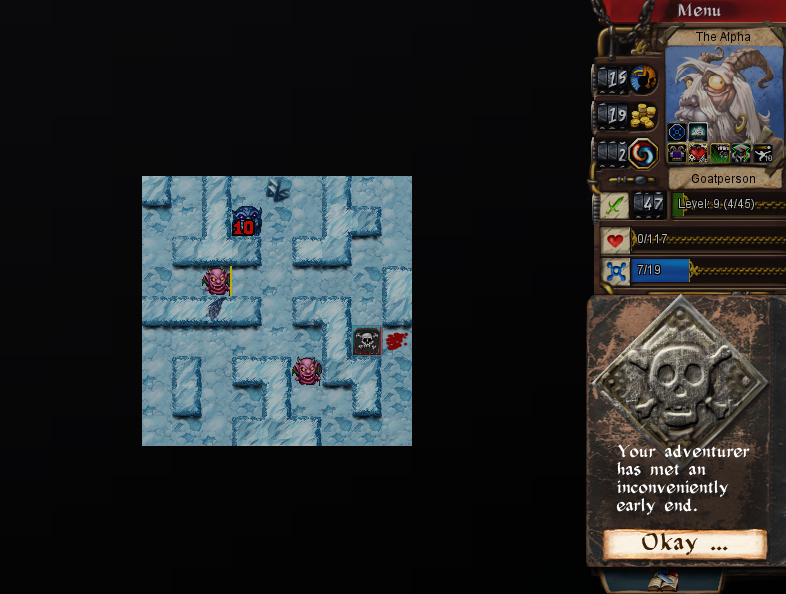 I had 11 piety left with Mystera with Binlor, EM, and GG on the board. I made the decision to go GG and heal what I could. Unfortunately, that means I had to throw away my 51% resists and take 5 corrosion. My two heals from conversion were only enough for one hit. I had to convert my APHEELSIK, BURNDAYRAZ, vampiric blade, and witchalok to get my final heal, thankfully preventing me from needing to desecrate Mystera, and allowing me this sweet, incredibly close kill shot. chandl34 wrote: Oh man, this was nasty. Anyways to the runs I acctualy documented. 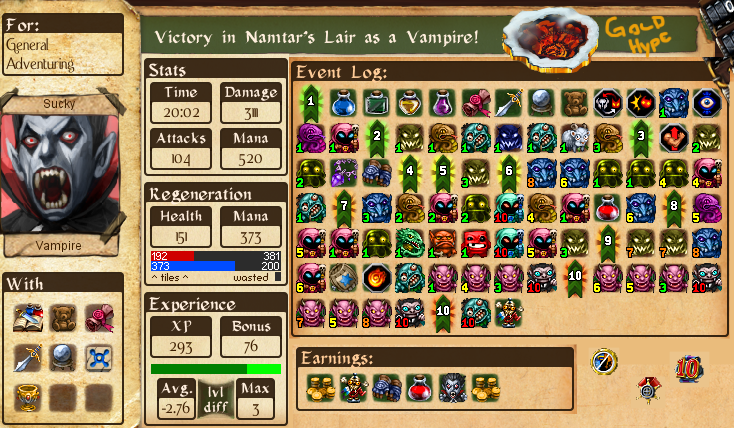 I finaly got Namatar's Lair down on Vampire, had some tough RNG on this. Goatperson & Monk remaining for gold. 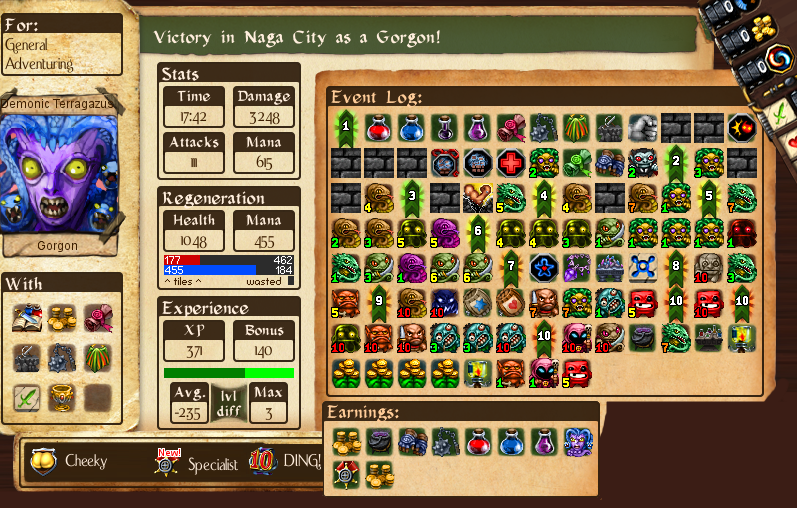 I also got what I would say is my best run in Naga City yet as the gorgon, I quite simply stomped every single boss. 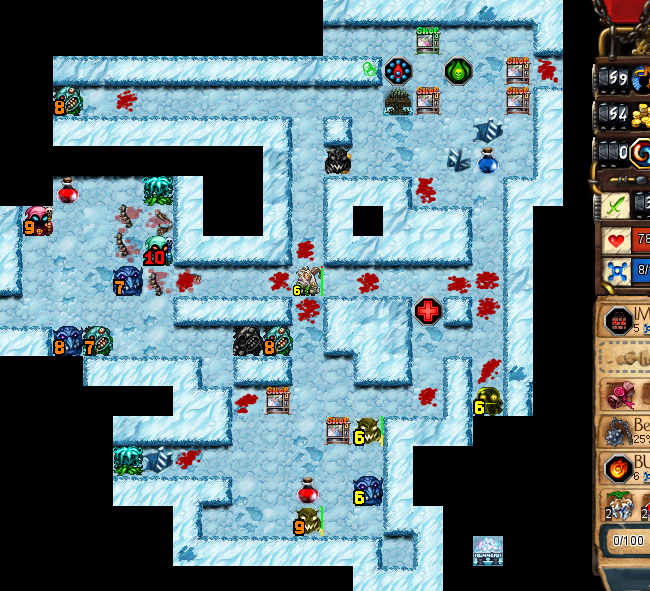 I had a whopping 3 potions left, most were unnecessary to be honest, I were being too greedy on the blackspace. I hardly used any blackspace for most of the bosses, and the prince went down easily because of posion strike. Any tips on how to keep food stock high? I'm currently prepping yendor but tbh it does not help that much. I am the king of the rats now! Bow before me, peasants. Yeah, baby! Enjoying the beach. * Kill low-level monsters for food, but your focus is to kill higher-level monsters to actually gain enough XP for leveling. * Don't use IMAWAL. That's 9 food you lose for each casting. Leave it on the floor and convert it for refills when needed. * Don't explore tiles that are obviously edge tiles. (Sometimes you don't know where a corridor will start, but sometimes you know that something is just an edge, then leave it dark.) This saves blackspace for the bossfight when you might need it, and conserves food during exploration / leveling when it's still scarce. 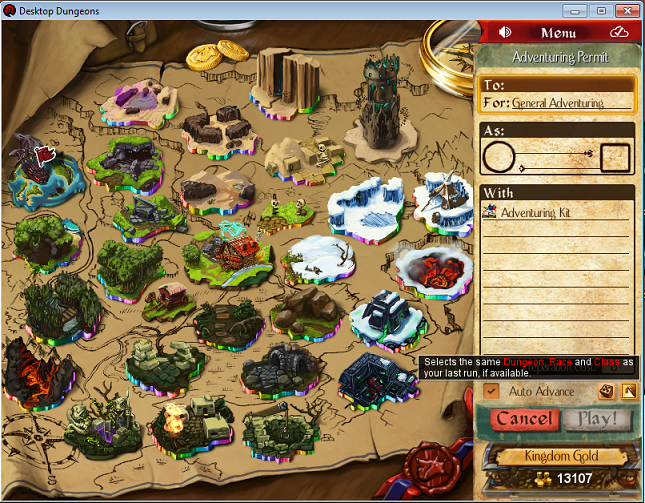 Also consider how much food you'll need to bring down - you only get 4 enemies per map and you have three long maps!! So you'll need to take down about 30-40 food to have a good chance. * Use yo-yo-ing to explore more food-efficiently (i.e. deliberately let your food deplete... explore until you're close to death... kill a monster then explore some more to heal back while food lasts... then explore until you're close to death again... kill another monster... repeat) Now, in your screenshot I see that you had access to B2P and HALPMEH, you could've used the combination of these two glyphs to "yo-yo" without having to deplete food first, which is great if you're short on popcorn. Had a really good goatperson run, learned the hard(and unobservant) way that non-exp valuable enemies do not give food. I will continue to try goatperson I'm starting to get a hang of it. GOATPERSON VICTORY! get that squared away. A hefty run, tikki tokki carried it for the most part, Poison, Tikki's Edge & Reflexes made some fight silly easy. AAAAAND MONK DOWN! I WILL NOT APOLOGIZE FOR ART.